I've lived on this beautiful blue planet for long enough to acquire a modicum of wisdom. Someone once told me that wisdom is useful because it gives one insight into the unknown based on similar, past experience. In fact, another way to say "Wisdom" is to say "Been there" for this is how it is earned. The problem with wisdom, of course, is that sometimes it reveals uncomfortable facts. For example, my own meager wisdom recently revealed to me just how caught up I was by "society's perceptions of normalcy". Now those are big words for sure (as required when one utters something wise of course), but their simple meaning is this: life had become a routine for me, mirrored and shaped by others' direction. I guess that in a way I had become somewhat of a puppet, mechanically performing the same dance over and over again as many of us do. Thus the purpose of this site. The old routine has ended. The path towards enlightenment and life's true fulfillment has become my new routine. Listen to the hawk's cry as it circles overhead. The splash of water as it plays against a sailboat. The chirp of a cricket who knows that summer's days are numbered. Your children laughing as they play a game you now remember from your own childhood. See the path made by an ant returning home to the colony. The deep blue of the sky when northern air is dominant. A single blade of grass, brown tipped at the top from being cut by a lawnmower. Smell the rich earth in a forest glade. The sharp scent of pine on a cool, clear evening. Fresh bread. Lilacs in spring. After the rain. Feel the sun's warmth against your face. Coiled rope in your hand. The bark of an oak tree. A baby's soft skin. May you also achieve enlightenment. 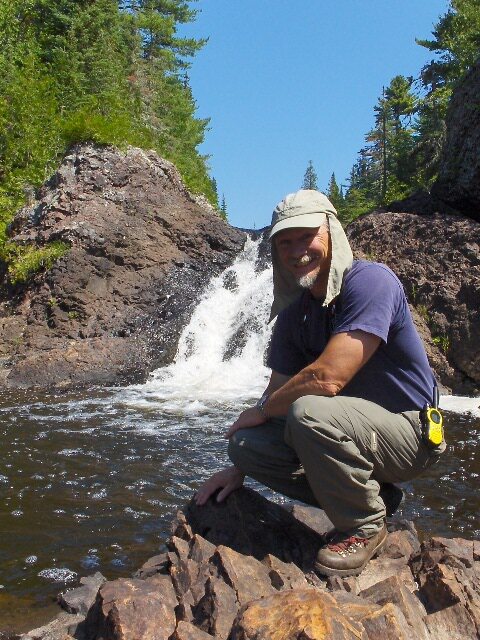 Here I am back in 2007, posing in front of previously unnamed falls deep in the woods of the Keweenaw Peninsula. Satellite imagery showed the "third falls" of the Montreal river but they weren't on any maps. Strange birdlike shapes on the photos added a sense of mystery to the place as well. How could we resist the call to expedition?